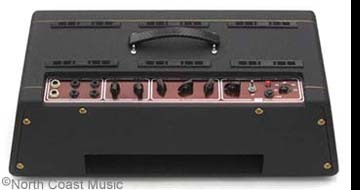 Distance from top of slider board to top of cabinet: 5.125"
Control panel cut out: 19 1/2" x 3 1/16"
The 1964-65 JMI Vox "slant" or trapezoid AC-30 amp head cabinet is considered by many to be the epitome of JMI (UK) Vox cosmetic design. 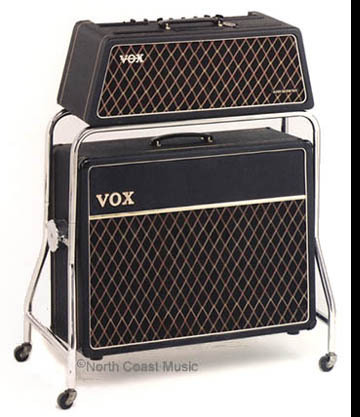 North Coast Music is now making it possible for you to convert your JMI era Vox AC-30 combo amp into a separate head and cabinet "Super Twin" with these accurate "slant" amp head, speaker enclosures and swivel trolleys. Vox has licensed North Coast Music to construct these unique cabinet reproductions. 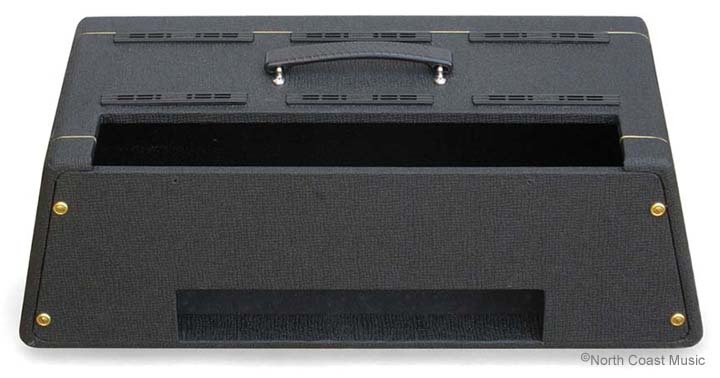 Constructed of 9 ply 1/2" baltic birch plywood, the trapezoid AC-30 amp head cab features lock jointed construction and solid pine internal gussets. As in the original, the front edges of the reproduction cabinet have been faced off to thickness of 3/4." Six Vox air vents, a Vox handle and an expanded aluminum bottom grill are all included. The removable back panel is fastened to the cabinet with brass oval head machine screws. The cabinet is covered in original style black basket weave vinyl and black diamond grill cloth. 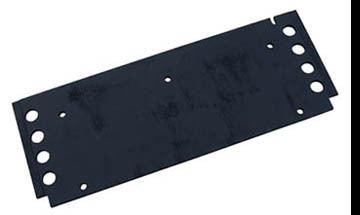 The chassis from your JMI Vox AC-30 combo will need to be mounted to a slider board that is exactly 24" wide. While not included with the cabinet, North Coast Music also offers replacement slider boards for these trapezoid head cabinets, see below. 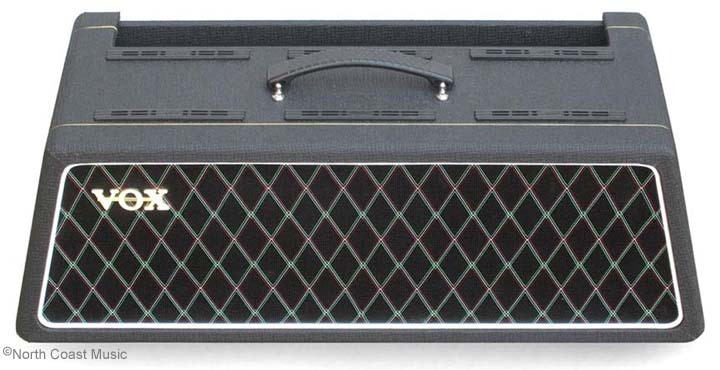 This cabinet will not accommodate amy other era of Vox AC-30 chassis than the JMI Vox AC-30/6. Please allow several weeks for delivery from time of order. There are no refunds or returns on North Coast Music Vox cabinets. Replacement Slider Board for chassis mounting on AC-30 Trapezoid Vox Amp Heads - Identical to the original piece, 3/8" thick baltic birch, 24" wide, all correct mounting and ventilation holes included.